Highland 2019 Winter Homecoming Members are top row, from left: Noah Dado, Tate Tobin, Chase Carpenter. Middle row: Jon Jensen, Cam Cutrone, Chase Ray. Bottom row: Brylinn Tuggle, Brooklyn Baird, Layla Grogg, Mariah McDaniel, Mary Schwartz, Cassady Sagar. 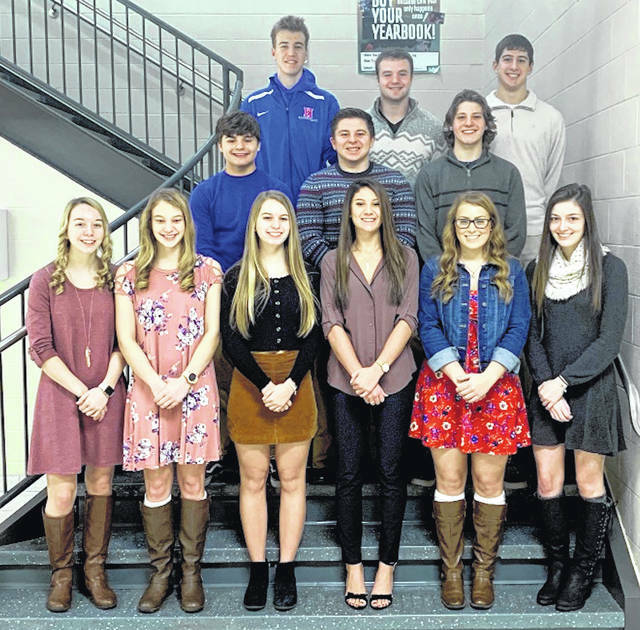 SPARTA — On Friday, Jan. 25, Highland Student Council will sponsor Winter Homecoming 2019 activities prior to the Highland Scots basketball game with Mount Gilead. The homecoming ceremony will take place between the junior varsity and varsity games. The court is elected by their classes to represent them. Freshman attendants are Brylinn Tuggle and Jon Jensen. Representing the sophomores are Cassady Sagar and Chase Ray. Junior court members are Brooklyn Baird and Cam Cutrone. Queen Candidates are Layla Grogg, Mariah McDaniel, and Mary Schwartz. King Candidates are Chase Carpenter, Noah Dado, and Tate Tobin. The King and Queen will be crowned by retiring Queen Krista Walters and retiring King Cody Holtrey.